This week I have guided two cycle tours in and around Utrecht. One group with policy makers and politicians from Bavaria and one with students from the university of Platteville-Wisconsin. It felt really rewarding to lead these groups to places I have written about in my posts and to show how connected everything is. Both groups were very different but equally enthusiastic. They were all fully aware that the way we do things in this country differs very much from how things are done in their own country and that different decisions lead to very different cities and towns with different opportunities when it comes to travel. The silence because of the lower numbers of cars was mentioned very often. 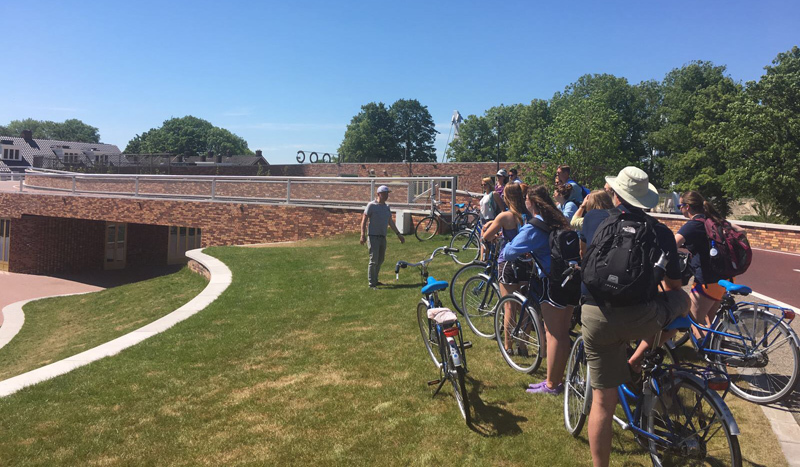 It was a beautiful day, almost too hot, when I rode with the American students. When we passed a beach in Houten these young people instantly saw that there were mainly youngsters like themselves and children there. There was hardly a parent in sight. What they also saw were the high numbers of bicycles parked right next to the beach. The freedom of cycling in one clear and strong visual. These kids and youngsters had clearly gone to that beach on their bicycles unaccompanied and they obviously had a great time. What a great freedom to enjoy! The Freedom of Cycling is the overall theme of Velo-City 2017, that is to start in two weeks’ time in Arnhem-Nijmegen. Cycling gives a great freedom to especially children and young people, who are not yet allowed to drive by themselves (so under the age of 18 in the Netherlands and most of Europe). I had filmed many young people going to school just a week ago and even though this is officially the ‘no-post’ week, I will share that short video here. Many people (mainly school children) crossing Eisenhowerlaan in Eindhoven on their bicycles. Some of the many lectures and presentations in the upcoming Velo-City conference also deal with the freedom cycling gives to children. One presentation – incidentally by the wife of one of my colleagues – is literally called “Freedom of Children”. Presenter Marieke Dubbelman lives with her family in Utrecht’s latest and largest expansion Leidsche Rijn, where I also took the students from Platteville. So it all comes nicely together here. I think it is very good to focus on children as they represent the future of cycling. If you get them cycling young they could keep the good habit for the rest of their lives. 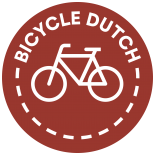 Interestingly enough that is the theme of a number of pecha kucha presentations at another Velo-City event called “Inspiring Cyclists of Tomorrow”. Lastly, one of the excursions goes to a primary school in Beuningen near Nijmegen to see the school run in action. Back to the guided tours. 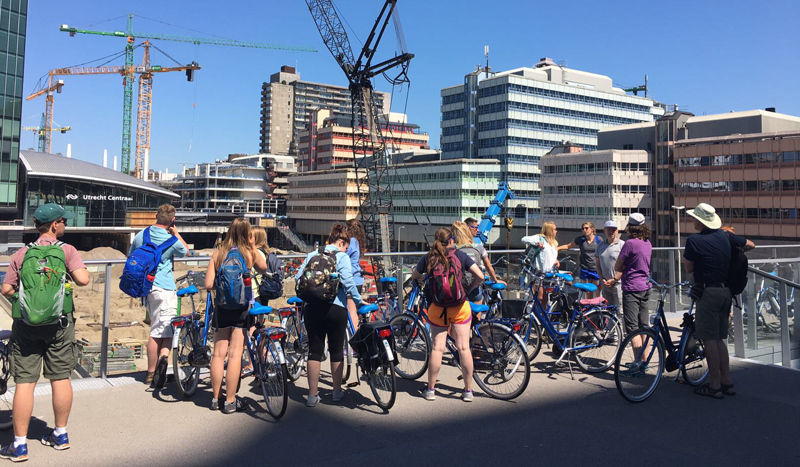 The group of Bavaria stayed in Utrecht, but the group from Wisconsin cycled all the way to Houten. I made a Google Map with links to the posts about what we saw during the tour. So you can virtually cycle along. Map of the guided tour of the students from Wisconsin. Who is the professor for the Wisconsin class? Associate professor Dr. Kristina Fields. Oh, that’s funny coincidence, i intentionally suggested you to guide the bavarian delegation, not knowing that they already booked your organisation to do so. Thumbs up and hopefully they come back with good ideas which can be realised in a very car-oriented legislative german environment that almost chokes any progressive idea in terms of reducing car traffic.. US infrastructure always seems like a big gray dot to me. One coloured makes it opaque (when you’re used to the Dutch, car, cycle and pedestrian lane design). And with those unnecessary wide car lanes (here we often make them smaller intentionally, as it reduces speeding). Misschien ook eens leuk om te laten zien hoe publieke figuren standaard de fiets pakken? Een minister (destijds Donner) die altijd de fiets neemt. Hoe de minister-president op de fiets bij formatieonderhandelingen aankwam. Etc. I don’t when, if ever, the city of Los Angeles will start implementing the quality of bicycle infrastructure that is in the Netherlands. When you see traffic engineers implementing designs like there are in this Streetsblog article you’ve got to wonder what they were thinking. Evidently one of the ideas behind the placement of the white bollards is to force cyclists into the motor vehicle lane to the left. I sent an e-mail to a city of LA traffic engineer about the use of the bollards as shown in the above link to a Streetsblog article. I suggested the bollards should be positioned to force the cyclists to swerve into the crosswalk of the cross street and I linked to three articles from BicycleDutch to help illustrate this. He did not agree with this. He believes cyclists should ride in a straight line to be as predictable and visible as possible. This traffic engineer believes that with separated bike lanes cyclists should be kept to the right of motor vehicles by the use of separate signal phases or partial protection by the use of physical protection such as floating curb extensions as is used in the Netherlands. He also stated that the future concrete curb extensions will not be in the path of planned bike infrastructure. The concrete curb extensions are to be designed for easy modification. 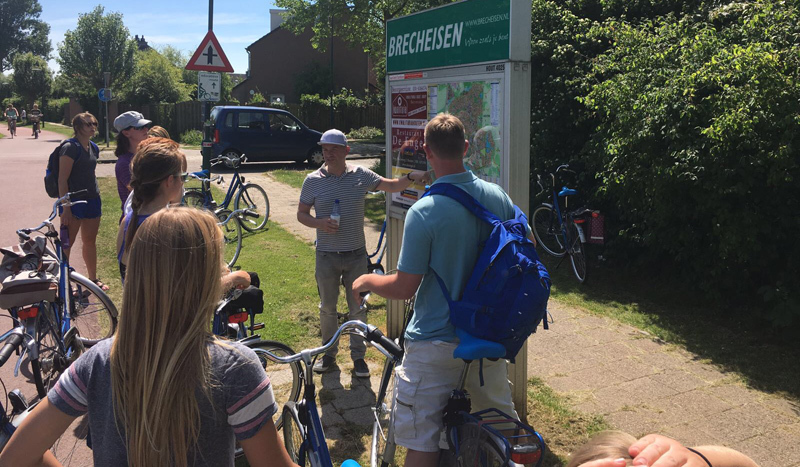 This entry was posted on 30 May 2017 by Bicycle Dutch in Original posts and tagged children, Houten, school, Utrecht.